Menstruation is an important indicator of both the function and the condition of the female reproductive organs. 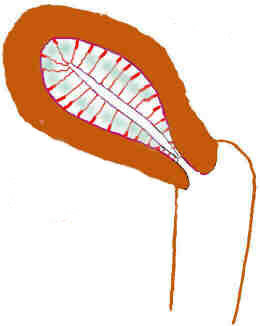 It occurs due to the unique lining (mucus membrane) which covers or lines the cavity inside the womb. This mucus membrane is so unique that it has its very own scientific name "The Endometrium". The endometrium is where most of the menstrual syndromes, excessive and scanty menstruations and conditions such as endometriosis and adenomyosis originate from. The understanding of normal menstruation will make it far easier to understand abnormal menstruation. The effects of the contraception pill and contraception injections will also be easier to understand. It will empower you with the knowledge to understand your own body better, to communicate with and understand your doctor's medical explanations better. You will be in a better position to decide about your possible treatment options and their consequences. The length of a menstrual cycle is calculated from the day it starts until it stops. It is usually 24 to 32 days with an average of 28 days. The bleeding lasts for 3-7 days. The color depends on the rate the bleeding occurs. Slow bleeding causes the color to become darker, even black. A slow rate causes the blood to take longer to reach the outside and old blood becomes darker . The womb forms substances that prevent clot formation and a normal menstruation is clot free. A fast rate prevent these anti clotting substances to be effective and clots form. We will now explain the changes taking place in the womb during the normal female cycle. The changes occur in the endometrium, and the way in which these changes occur is the basic reason for the monthly menstrual bleeding. These changes are illustrated below. The endometrium immediately after the menstrual bleeding stopped. It is very thin compared to its thickness later in the cycle. The endometrium about one week later (12-14 days since the onset of menstruation). This is just before ovulation. (Ovulation = the release of an egg cell by the ovaries) The endometrium is now much thicker (usually more than 6mm). The blood vessels are still represented by red lines. This thickening is caused by estrogen. (a hormone released by the ovaries). The endometrium a few days after ovulation. Glands develop and the blood vessels become more prominent. The protein content ( purple blotches) in the endometrium increases. The increased gland activity is responsible for the production of these proteins. The proteins are important nutrients for` the embryo following implantation. The changes now seen in the endometrium are caused by a hormone called progesterone. (a hormone also secreted by the ovaries, but only if ovulation occurred and only for ten days. The endometrium immediately before the onset of menstruation. The inner part of the all the arteries have a curly (spiral) appearance and are called spiral arteries. The protein content in the endometrium has also increased. All these changes ( increased protein and spiral arteries) are the result of progesterone activity. The endometrium is now ready for implantation. Menstruation starts. Pregnancy did not occur and the coronal levels dropped. (The ovary temporary stopped producing the hormones estrogen and progesterone.) This lack of estrogen and progesterone causes menstruation to start. Blood starts leaking out at the bases of the spiral arteries and the inner two thirds of the endometrium is discarded . 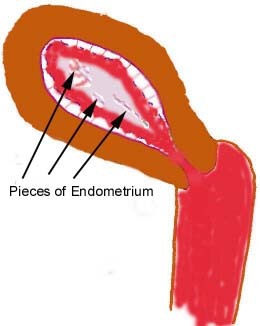 The upper two thirds of the endometrium is discarded. The arteries are exposed (not covered by mucus membranes) and are bleeding freely. Special anti clotting substances are also released to prevent the menstrual blood from clotting. The purple line represents a new endometrial cover. The ovaries start producing estrogen again and estrogen causes the new lining to develop. The purple line represents the endometrial cover. It covers the endometrium and blood vessels completely. The bleeding stops and a new cycle begins. The bleeding has stopped completely and the cycle starts again. A detailed description of abnormal menstruations. The structure is more complicated than discussed on this page. We just touched the very basics. Click here for a more detailed graphic description of the endometrium. This page contains basic drawings that show the endometrium in more detail and illustrating the changes taking place in greater detail. It is important to understand the endometrium. The endometrium is where most of the menstrual syndromes, excessive and scanty menstruations and conditions such as endometriosis and adenomyosis originate.